I met recently with Tianji Xu, development manager for the Prosper Center, a newly completed 1.6 million square foot office development in Beijing's CBD. Prosper is the first LEED-CS Gold certified building in Beijing and is still the only rentable LEED office space available in the capital. Tianji said the decision to pursue certification under the US Green Building Council's LEED rating system was a no-brainer for two reasons. First, he sees LEED as the emerging world-class green building standard. LEED was used in order to attract multinational tenants, since many of them are already familiar with the system from their home markets. Second, he felt the scorecard system provided the development team with the most flexibility in pursuing the Gold rating. I've heard similar things from other developers and green building professionals in China, and suspect that LEED will quickly solidify itself as the leading (no pun intended) rating system for green buildings in China and internationally. Tianji estimated that Prosper cost 8% more than a standard office building due to its green features. He attributed most of this premium to the increased cost for the high-efficiency systems (low-e glass, HVAC, etc) that had to be imported from America and Europe. Interestingly, he said he didn't think they could have brought it in any cheaper without sacrificing quality. Hopefully, as more local Chinese building product manufacturers see the potential in the green building market, they will begin to mass produce high efficiency systems, lowering the costs for green both in China and internationally. 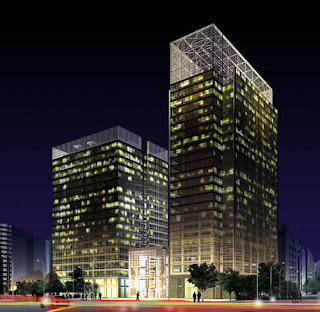 Prosper Center is super-premium Class A space and charges some of the highest rents in Beijing. At this point, the building is about 75% leased up. Tenants include CB Richard Ellis and East Asia Bank. I think CBRE is an interesting case study; since they have an internal commitment to only occupy green space, they essentially had no choice but to occupy the Prosper Center. As more and more multinational tenants adopt this type of internal policy for their international operations, demand for green buildings in China will boom. Given the severe lack of supply (again, Prosper Center is the only leasable LEED space in Beijing), this will be a huge opportunity for developers who can get ahead of the curve. Tianji agreed, and thinks green building in China will take off within the next 5 years. He also mentioned that they chose to build green not just to appeal to tenants, but also to investors. Might this mean that investors already recognize how the growing demand for green buildings will affect the real estate market? Stay tuned. Glad to see that you've settled in enough to blog! Thanks for sharing that. Will be looking forward to reading about your experiences and insights in the exciting China. By a serendipity, I just read an article on China's Green Building Council. I wish you all the best of luck and look forward to catch up with you in Greenbuild! "Let's do some math: China's government-mandated need to reduce pollution and energy consumption + the country's slowly rising environmental awareness + its thriving spirit of entrepreneurship + China's construction market, which builds nearly half the world's total new buildings every year, and by 2020 will account for 40 percent of the country's total energy consumption"
Congratulations on your new blog! You're an inspiration to us all. This kind of info helps professionals understand trends in China and that's good for all of us. I'm eager to keep reading regularly.